Kraft bubble mailers 14.25 x 19 Padded envelopes 14 1/4 x 19 by Amiff. Pack of 10 Kraft Paper cushion envelopes. Exterior size 14.5 x 20 (14 1/2 x 20). Peel & Seal. Mailing & shipping & packing. View More In Envelope Mailers. KRAFT BUBBLE ENVELOPES with Peel and Seal. 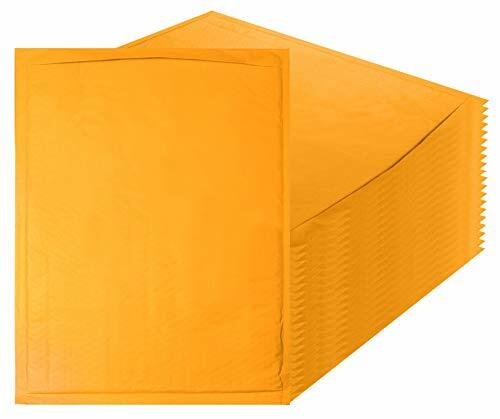 PACK of 10 yellow padded mailers. Useful space 14.25" x 19". Outside size 15.5" x 20". Manufacturer size tolerance +/- 25". Highest quality, structurally sound materials to provide both visual enhancement and security. Pad mailing bags have recyclable and laminated construction. Golden bubble mailers provide outstanding low cost shipping protection for a wide variety of products. Padded kraft paper envelopes are an eco-friendly solution to you mailing needs. Each mailer is made of recycled gold kraft paper with 3/16" bubble lining for added protection and padding. These oversize packing envelopes offer stress-free shipment with their multiple security features. Superior cushioning provides more room for your products and prevents tearing with items that have sharp edges. The peel-n-seal closure creates an air-tight, impenetrable finish to prevent contents slipping out and unwanted views of the product inside. The reinforced cushioning lining protects the interior from damaging forces during the shipment process. Designed to withstand moisture and the tough conditions experienced during shipping that cause rips and shreds. Order in bulk with wholesale price and receive a special video we prepared for our customers! KRAFT PADDED ENVELOPES 14.25 x 19: Kraft Paper Bubble Mailers 14 1/4 x 19 by Amiff Inc. Pack of 10 self-adhesive mailers. Shipping envelopes with Peel-N-Seal. Exterior size 15.5 x 20 (15 1/2 x 20). Manufacturer size tolerance +/- .25". Approved by USPS, UPS, Fedex, DHL. Yellow Paper bubble envelopes are Amazon's choice. Shipping labels easily adhere. Kraft exterior presents an excellent surface for custom print and pen writing. Ship with confidence. Waterproof and tearproof mailers. PREMIUM QUALITY: Self sealing packing mailers are made with the highest-quality, structurally sound materials to provide visual enhancement and security. Cushioned envelopes are lined with 80gsm bubble, with unique air cellular layers and 360° strong air bubble technology helping absorb shock during shipment. These heavy duty mailers are tough enough to take on long, rough shipments with multiple processing centers and handlers without risk of penetration. Weatherproof cushion envelopes. SECURE & PRIVATE: High-slip shipping bags are two-tone. Sturdy layers help ensure privacy by blocking light and shielding contents from view. The industrial-strength, long-lasting closure seals the package completely without the ability to open or remove items before they arrive at their destination. Self-sealing. Strong adhesive strip. Self-seal closure that is pressure sensitive & tamper evident. Durable, moisture resistant packaging. LIGHT WEIGHT: The weight of each mailer - 1.71 oz. Padded mailing envelopes are impressively designed to optimize space without adding additional weight. Using featherlight, nearly weightless materials, сolored сushion mailers help reduce the cost of shipping without sacrificing package safety. Custom envelope is made of Fully Laminated Kraft paper to 3/16" bubble film for maximum protection. MULTIPURPOSE envelopes can be used in offices, at home, in shops, schools and everywhere where there is a need for shipping. These versatile packaging envelopes are great for mailing: documents, cell phones, gift cards, invitations, books, makeup stuff, cosmetics, phone accessories, medical and drug supplies etc. Solid color packaging mailers feel nice to the touch and are perfect for handwriting, labeling and stamping. 100% SATISFACTION GUARANTEED. If you have any questions about this product by Amiff, contact us by completing and submitting the form below. If you are looking for a specif part number, please include it with your message. Kraft bubble mailers 10.5 x 15 Padded envelopes 10 1/2 x 15 by Amiff. Exterior size 11x16 (11 x 16). Pack of 10 Kraft Paper cushion envelopes. Peel & Seal. Mailing, shipping, packing, packaging. Kraft bubble mailers 6x9 Padded envelopes 6 x 9 by Amiff. Pack of 20 Kraft Paper cushion envelopes. Exterior size 6x10 (6 x 10). Peel & Seal. Mailing & shipping & packing & packaging.